The Setup My good friend and one of my training partners John Cash (not the singer) and I hit the road mid-morning on Friday to drive up to Le Grange, WI. 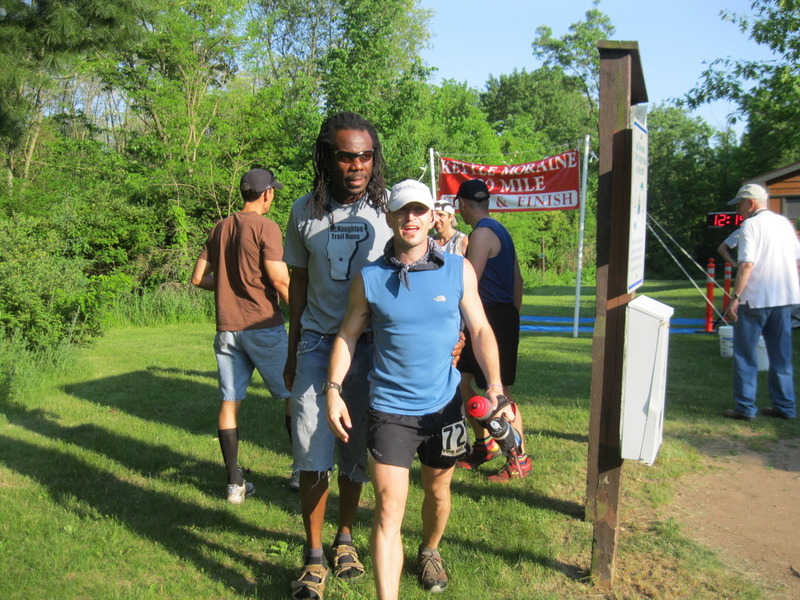 I was running the 100 mile and John the 100k with the Tahoe 100 in his near future. It was hot heading out of the St. Louis area and it was not any cooler in Le Grange. The mercury was over 90 degrees in both place and while some of that heat was around the last two weeks in our neck of the woods, it was happening all of a sudden in Wisconsin. The problem for me was since I was tapering I was not really spending much time in it so by no stretch was I ready for it. Luckily, the forecast showed that it would not be much over 80 on Saturday and that there may be a bit of rain in the afternoon. This would be ideal... if it happened. The Course The course is made up of 2 parts. The first is a 100k which is a 62 mile out and back. This is the Start/Finish of the race as well as the entire course for the 100k runners. The second part of the course is a 38 mile out and back. The course itself is almost all off road, made up of wide Nordic trails, rolling prairie, or winding single track. Due to how the trail winds along the area, aid stations are highly accessible via road by both crews and the volunteers. The longest distance traveled between aid stations over the entire 100 miles is 5 miles and most of the time you travel no longer than 3 miles to either a manned or unmanned location. To say it was a hot day is a bit of an understatement. Now, I'm not talking Badwater hot but 77 degrees at 4:30 am in Madison, WI the first week of June is a bad sign. The forecast had called for 80, but with the sun yet to rise and that mark already approaching, 80 would be here and gone in no time. John and I got our stuff put together then headed out the door for a short 10 minute drive to the race start. When we arrived I could not believe how many people were out. 121 people were lined up for the 100 mile and 60 rolling in the 100k. I was able to meet up with my friend Ryan Dexter who was going to be crewing for me during the day, then pacing for me though part the night. It gave me great confidence to have such an experienced and talented runner in my corner, plus with my time crewing and pacing Ryan during the McNaughton in Vermont 200 the last 2 years, we've spent a fair amount of time together on the trail. Returning from my Leadville crew later on in the day would be Dema and Randy. I did the normal stuff when we arrived, chatted, lined Ryan out with some simple directions of food. Basically, have Nuun ready to go in one bottle and water in the other. Hand me a few gels every time I see him, and if it gets hot, fill up my bandana with ice. 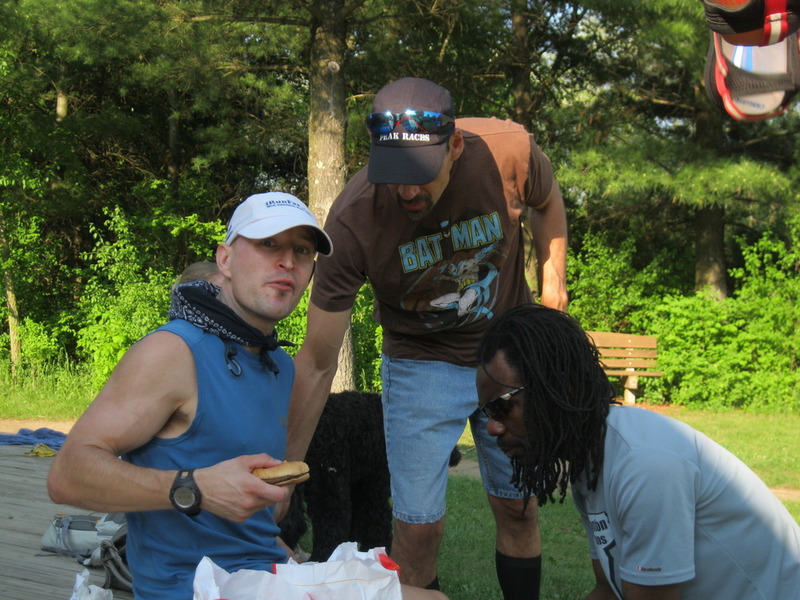 Besides that it was pretty simple, eat from the aid stations and keep moving. We took off when the RD said "GO" at 6am. I always try going out nice and easy. I wanted to hit the 50k mark in about 5:30. I cruised along, chatting with others and we ran. I hit the first mile or so in 9:45 and pretty much held that effort for the next 30. The problem was it heating up fast. I was soaked so I finally took my shirt off to avoid chaffing from that wet heavy fabric rubbing on me. The prairie areas were rough. 100% exposed wide trail with tall grasses on each side. It was already hot in here and going to get worse the next time though. Ryan was there at every crew accessible spot to crew and the non-crew accessible to snap some pictures. I hit the 50k mark in about 5:18. Ahead of where I wanted to be but the temps were suffocating. I stood there for a bit, sponged off, and took in a lot of watermelon, bananas, and anything else that looked good. I shot back out of the aid station to work my way back toward the prairie sections again. Luckily at some point, the sun sat back behind some clouds when I was on the single track. I was hoping it would hold on until I was though the prairie but it was short lived. I hit the exposed sections and I have to guess it was over 100 degree for the heat index. No shade, hardly any breeze, all the tall grasses seemed to hold the heat in. I was fading really fast. The next time Ryan saw me was around mile 37. He started pushing calories hard and I tried to put down as much as I could over the next 10 miles. I popped out of the prairie section around mile 47 and into the aid station. Everyone was talking about how bad everyone looked and I seemed to be doing well. I ate more food then took a salt pill and within 10 seconds, I stepped away from the aid station and just puked up everything that was in me. Not to be gross, but in terms of volume, I did not know my stomach could even hold the amount of liquid that came back out. I sat there a second then Ryan said "I'll give you 30 seconds then you need to get going" I just said, "nope, I'm going now" and stood up really quick to try to jolt myself going again. I drank a cup of water and got back on the trail. I had not gone 50 feet and it all came right back up. I decided I had to let things settle, so I told Ryan I was going to hold off on anything for a bit. I was just sipping a little here and there to keep my mouth wet as I moved along. I actually felt better but knew I had to start getting calories and liquids going again soon. The temps were too high to wait anything out too long. I took one gel, one SaltSick pill and a mouthful of water in a 5 mile stretch. When I saw Ryan again he said "take these" and opened his hand. It was 2 SaltStick pills. He then told me “I want both of these gone by the next time I see you in 5 miles.” It was 2 water bottles; one with double Nuun and another with something he takes that had electrolyes in it (still don’t know what it was exactly from a product standpoint). All this worked and I started coming back. My electrolyte balance had been way off and I was too far under to get the fluids out of my stomach. This super push of fluids and salt was just what I needed. Even with a renewed mental attitude, my legs were killing me. They took a beating with me messing up my fluid intake. I was cramping and just working way too hard. Everything hurt. As I was closing in on about mile 56 or so I hear "Travis!" I was my buddy John. He had some of the same issues I had early on in the race and had caught back up to me. We worked our way back in to the 100k mark together. Chatting and just trying to keep the motivation high. There are mile markers on the ground and since this is an out and back I could see where I sat in the overall. Surprisingly, I was not that far out. Zach Gingerich was about 7 miles up on me, followed 2 miles back by Mark Tanaka, then after another 1/2 mile or so by my friend Paul Shoenlaub, then Jacob Joseph, who I had been running with several times during the day. That was about it until the finish line. John and I crossed the 100k mark together. He could have picked up some time here but he held back with me to keep me motivated and help me though a really low spot. That’s a good friend and training partner right there! John finished 7thin the 100k! When I arrived at the 100k mark I see Dema and Randy waiting for me. Earlier, Ryan has asked if I wanted them to bring anything and I said; "McDonalds hamburger with no onions, fries and a coke" and BOOM! they delivered. I was in a daze here, mentally very cloudy. I was just dreading the idea of going back out for 38 more miles. I sat down, had Dema massage my calves, and threw on my calf sleeves. I ate my burger and drank this coke. It was good, really good. Ryan was ready to get out there with me so I got my head right and got out of there. 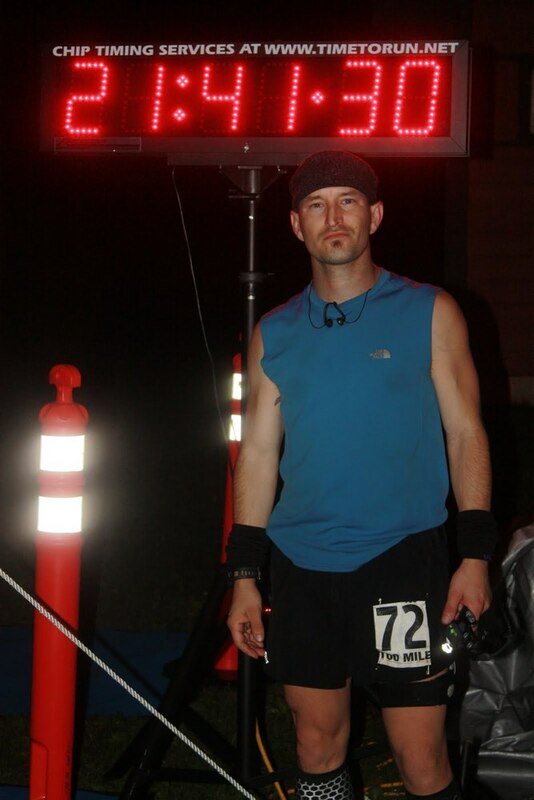 I was the 7th 100 miler through but 5th and 6th dropped so I was in 5th leaving at the 12 hour and 19 minute mark. I ran down Jacob and took a hard pass on him. He tried to hang for a minute but I just pressed it to open a gap. I was not sure how much I really had in the tank, but figured if I could make a good showing here maybe he would back off. It either worked or he was just hurting as bad as everyone else as I opened this up and did not see his headlamp behind me again for the rest of the race. I was now in 4th and had some serious folks in front of me. Badwater champion and the course record holder, Zach Gingerich, previous winner and super solid runner Mark Tanaka, and my friend Paul who was 16th overall at Leadville last year along with being a Mountain and Grand Slammer who at 51 is running better than ever, which is saying a lot. I just tried to keep working hard. I did not have much of anything left. My right quad was trashed and I could hardly lift my leg up, but somehow I was still moving forward so what the hell, keep going, what else did I have to do? Ryan and I were leaving the Highway 12 aid station as Zach was coming in. He has about 8 miles on me. This was a very positive moment for me. He looked bad.. really bad. Just like me and everyone else. Even though this was not playing out like I wanted it to, it was not for anyone else either and I was still in it. Not only that, but I was in the hunt! As we approached the aid station at mile 81 I saw the two guys in front of me. 1st was Mark who was hurting but still moving forward at what looked like a good clip. Next was Paul who had climbed up to just a minute or so behind Mark. Paul told me to keep working and he was glad to see me out there. His wife Cindy gave him an update on my puke explosion at mile 47 so he was not sure if I would be still out there or not. This was again good for me. I was gaining confidence that I was running with a solid crowd and it was not over yet. I hit the Rice Lake aid station at 81 miles and sat down for a minute. I drank an entire can of coke and a full cup of soup. I was still not what I would call 100%. Even given the mileage I was moving really slowly to what I feel like I am capable of. The daytime had put the hurt on me. My quad was at the point where I could not run up even the slightest incline. For lack of a better term, it was not firing. However, I can do a mean power walk so when it was not flat or down hill, that’s what I did. Randy hopped in for this leg with me. We worked our way back and just tried to hold down a decent moving pace. Speed was out so consistency was in. Before I knew it, we were back at the Highway 12 Aid Station. Again, more coke, more soup and off we went. Ryan was trying to get me worked up. "You're in it, go get it!" I crossed over the timing mat leaving the aid station and the volunteers yelled "You are 6 minutes behind Mark!" It was actually more like 10 but hey, I liked the encouragement. Randy and I just kept pressing ahead. As I came into the unmanned aid station on Duffin Road, I caught the reflective trim of Mark’s shorts as he was climbing the hill across the street. He was right there! Now, I get that he was way below his best time out here, but not in my wildest dreams did I ever think I'd be within striking distance of someone of his caliber. We left the aid station and within 15 minutes or so, I had passed him. By the time I hit the Bluff Road aid station at 92.8 I was sitting in 3rd place. I again grabbed for the soup and soda and kept moving. It was a pretty great feeling to be sitting in 3rd place at this point. But it was far from over. 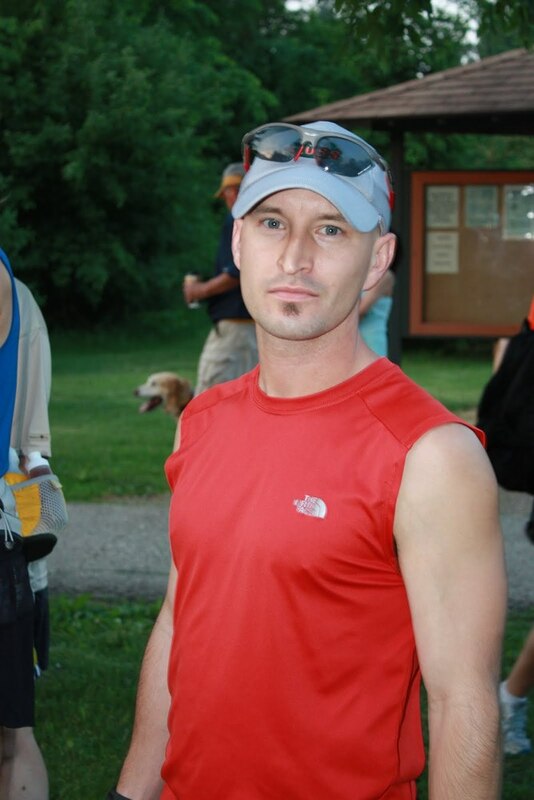 Mark is a great runner and letting up was not an option no matter what type of shape I was in. Dema was running with me now and we just talked and kept moving. He made me a deal to run the flats and downhills, and then walk the uphills. This is how I run pretty much every race so it was not much of a deal for me but at least we had a plan for the next 7 miles. The last 7 miles are a familiar place since it’s the first section of the out and back for each leg, meaning this was the 4th time I had ran this section today. The next aid station out of Bluff was less than 3 miles away then from there it was less than 5 to the finish. Since there were mile markers on the ground I decided I want to hit each one in 15 minutes. This broke it down really easy for me. Everything hurt bad, my right quad was so worthless I could hardly pick my leg up to get my foot higher than about 4 inches off the ground..... not the best thing for a trail race. Fortunately there was not a lot of technical footing left. We landed each of the next 3 mile markers out of the aid station at almost 15 minutes on the nose each time. I kept looking back to see if Mark was closing in on me. It was so hard to tell because there were still 100 mile relays and 38 mile fun runners on the course. However, Mark and I use the same headlamp so I can identify it. I turned to see a single bright headlamp in the distance and thought, "here we go, just hold on." I tried my best to move the pace up and just then I see the red glow of the clock just though the trees. I'd made it! I hear a huge scream of "TRAVIS!!!!!" from Ryan. I shuffled my way across the finish line exhausted in 21:39.44. Ryan, Randy, Dema, John, and my good friend Tommy (whose girlfriend won the women’s 100 in 23:30) were all there to celebrate with me. Hugs all the way around from me. Also, 2nd place finisher Paul Shoenlaub stuck around to see me finish, which was a fantastic gesture. Paul is a fellow SLUG, and someone who really gave me some great advice along with letting me tag along on some of his workouts out at Leadville last year. I have a ton of respect for him and to see him there really meant a lot. I sat down, ate some food and just took it all in. It was a very unrealistic feeling to be done this close to the front. I waited for Mark to come in a mere 13 minutes later and cheered as he crossed the mat. Guts is what it took today. Not just from the folks up front, but from everyone on that course. Times were roughly 3 hours slower than most years (almost equal to 2010 due to severe storms.) The Finishing rate was 38%. I was truly amazed at the effort given at this race. Tim-O and Jason were excellent RD’s. At no point did an aid station not have what I was looking for. Every place was loaded to the gills with ice which is hard to do with a running crowd of close to 200 for the 100 mile and 100k, plus the addition of the relays and the 38 mile fun run at night. Well organized and off the charts in terms of service. Along with that I had great friends and crew that were with me through the good and the bad and it made all the difference in the world on getting me to the finish line on a very hard day… and night.